The best known way to obtaining loads of Pokemon Candy is by completing Catch Combos. The more Pokemon you catch of the same species in a row, the more candy you will obtain for each capture (as well as releasing the Pokemon afterwards). If you're looking to farm Tough Candy in order to boost your Pokemon's Defense Stat, then the best place to go is Mt. Moon. 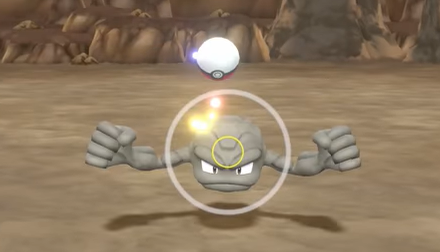 Here, Geodude is extremely common to find, and, you guessed it, Geodude is a Pokemon that will yield you Tough Candy from both being captured and released. The greater the Catch Combo you earn by catching Geodude, the more Tough Candy you will obtain. Have a Cheat or Hint of your own in regards to this game? Share it with us Here!